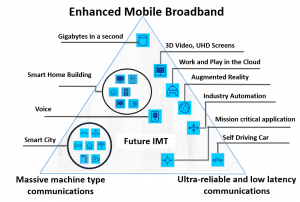 It is commonly considered by the International Telecommunications Union (ITU) that there will be three usage scenarios for 5G mobile broadband communications: enhanced mobile broadband; ultra-reliable and low-latency communications; and massive machine-type communications. The Cellular Internet of Things (C-IoT) may cross over all of the usage scenarios, with a majority of connections falling into massive machine-type communications. The case of massive machine-type communications is characterized by a very large number of connected devices typically transmitting a relatively low volume of non-delay-sensitive data. Devices are required to be low cost and have a very long battery life, such as five years or longer. Additional use cases are expected to emerge that are currently not foreseen. For future IMT, flexibility will be necessary to adapt to new use cases that come with a wide range of requirements. ITU continues to work closely with administrations, network operators, equipment manufacturers, and national and regional standardization organizations to include today’s 5G research and development activities in the IMT-2020 global standard for mobile broadband communications. Although the needs for these usage scenarios are quite varied, one commonality that is shared is the requirement for standardization. Driving the work for standardization of C-IoT is the Third Generation Partnership Project (3GPP) which has been working on standards for machine-type communications with a particular focus in Releases 13-15. 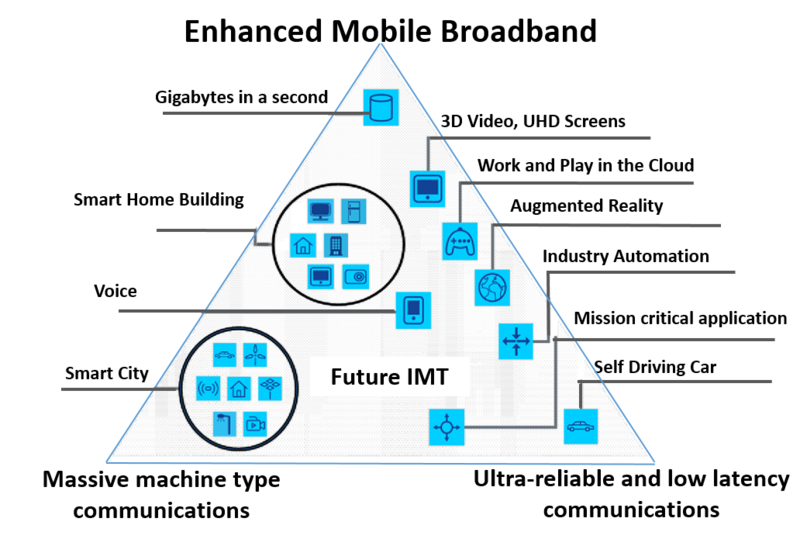 3GPP plays an important role in IMT-2020 and has had a program underway for developing these new 5G technology solutions for IMT-2020 since early 2015 (see Figure 2), with its initial 5G RAN workshop in September of 2015. Work in 3GPP on 5G standardization is based on the foundation of LTE through LTE-Advanced Pro for which standardization is running in parallel to development of 5G standards. Figure 2. 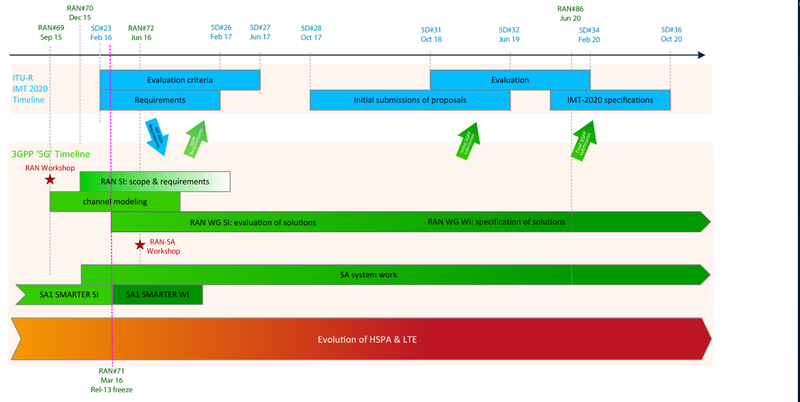 Initial 3GPP timeline for 5G. With these requirements in mind, the idea was to design a communication procedure that could coexist with current 3GPP systems deployed in the same frequency bands, that was not backward compatible but rather “new slate.” The aim has been to enable the introduction of new IoT technologies as much as possible with only a “software upgrade” to the current 3GPP Radio Access Network nodes. C-IoT focuses on GSM/GPRS technology (currently the leading M2M technology in many countries due to its low price and good coverage) while NB-IOT focuses on LTE technology. Therefore, C-IoT was designed to share radio resources with existing GSM/GPRS systems using the 200 kHz channelization and to a large extent re-using its design principles. C-IoT addresses the reduced complexity of adopting a half-duplex 200 kHz connectivity that enables the single chip solution that could easily integrate the single RF chain needed. C-IoT also achieves up to 20 dBs increase in the MCL (Maximum Coupling Loss) compared with GSM using blind repetitions, and modifications on the control channels. In order to achieve aggressive requirements for IoT services, a major modification on the LTE physical layer is needed as its initial LTE design was for mobile broadband. NB-IoT operates in one single PRB (i.e., 180 kHz) in order to guarantee that these communication devices — named as user equipment (UE) category (Cat.) NB1 — could be a single chip solution including the RF components. 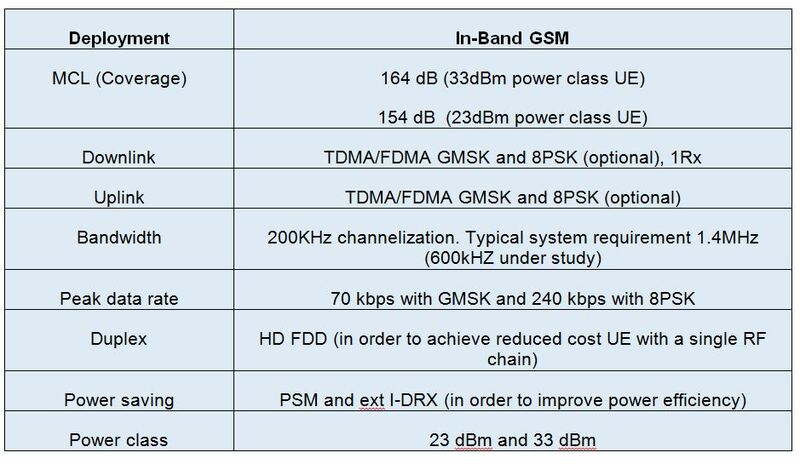 However, LTE has been designed for UEs with at least 1.4 MHz bandwidth and is therefore capable of receiving and processing 6 PRBs per slot. Therefore, in order to fully operate a single PRB a substantial redesign of many physical layer aspects — including data and control channels — is needed. Since these physical channels should be contained in a single PRB, they need to be spread over time in several sub-frames. In fact, for the provision of NB-IoT a total of eight new channels and reference signals have been defined. Therefore, legacy LTE control information is not used, and the new LTE NB-IoT deployed in-band can be considered as a parallel RAT, using current eNB radio resources, with the advantage of reusing the same hardware and, of course, the same RF components and antennas, which can be software upgraded. Table 2. Characteristics of NB-IoT for LTE. UE Cat. NB1 are based on much lower bandwidth usage (just one PRB, i.e., 180 kHz) than any other UE Cat including UE Cat. M1, and Half-Duplex operation for FDD, therefore present much reduced complexity integrated in a single chip (including the full RF with Power Amplifier required for the provision of the 23 dBms) with the trade-off of lower data rates. In order to enhance the 3GPP system for the provision of IoT communication between IoT-UEs and service provider platforms, architecture modifications have been introduced. The targets are to adapt the current 3GPP system to the new IoT requirements (low energy consumption with small and infrequent packet transmissions) and also include new services as subscriber management, security, control plane device triggering, etc. This work continues in Release 14. Standards will create the framework for the future connection of a system of “all things” connected. 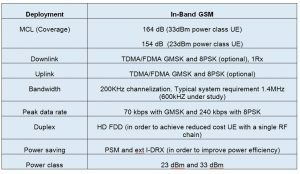 For more information, read Inside 3GPP Release 13: Understanding the Standards for LTE-Advanced Enhancements: 2016 Update.